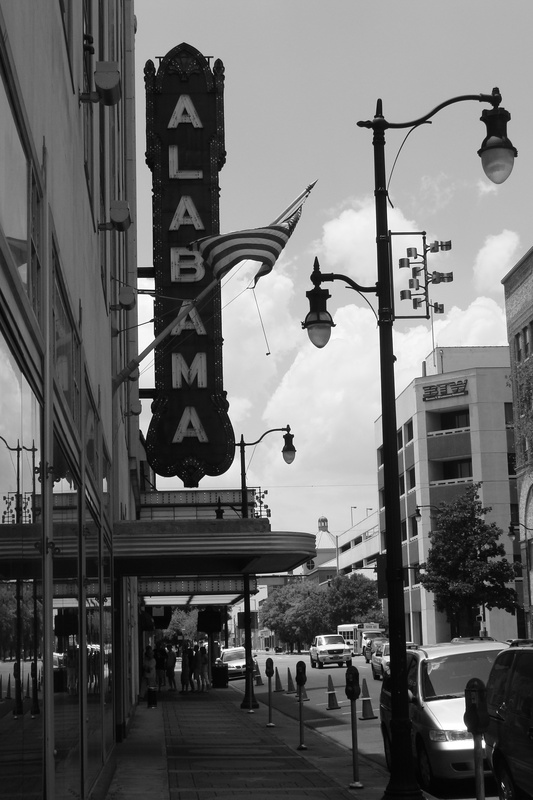 Last week, the True Classics crew–all four of us–gathered in Birmingham at the historic Alabama Theatre to see the 1962 classic To Kill a Mockingbird on the big screen. Seeing films at the Alabama is an experience. There really is no other word for it. Stepping into the lavishly redecorated lobby–restored to its early splendor in the 1990s–is liking taking a step back in time, with gorgeous gold leaf detailing and ornate lighting fixtures, a grand staircase to the upper levels, and, of course, its “Mighty Wulitzer,” only one of twenty-five of its type ever built (and one of the few still standing–and functioning beautifully!–in its original location). 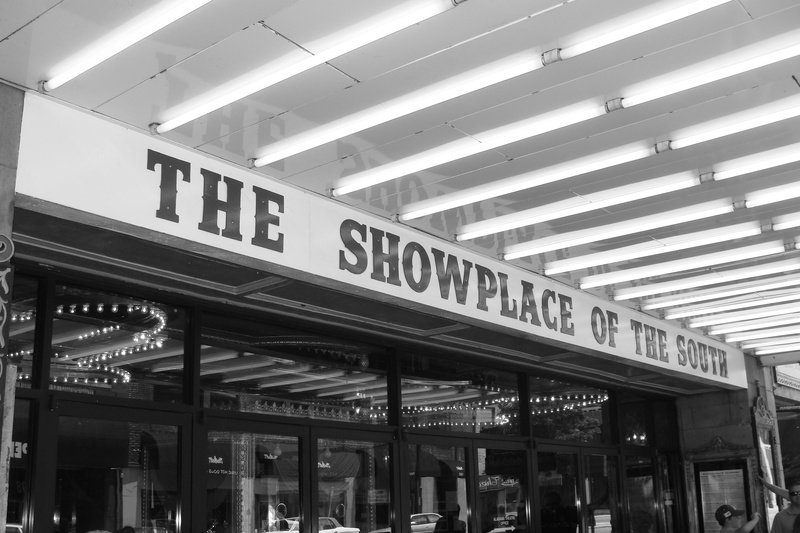 The Alabama is called “The Showplace of the South,” so named upon its opening by Adolph Zukor, the founder of Paramount Pictures. The theatre was built by Paramount as the showpiece of its southeastern chain of movie palaces, and opened in 1927. 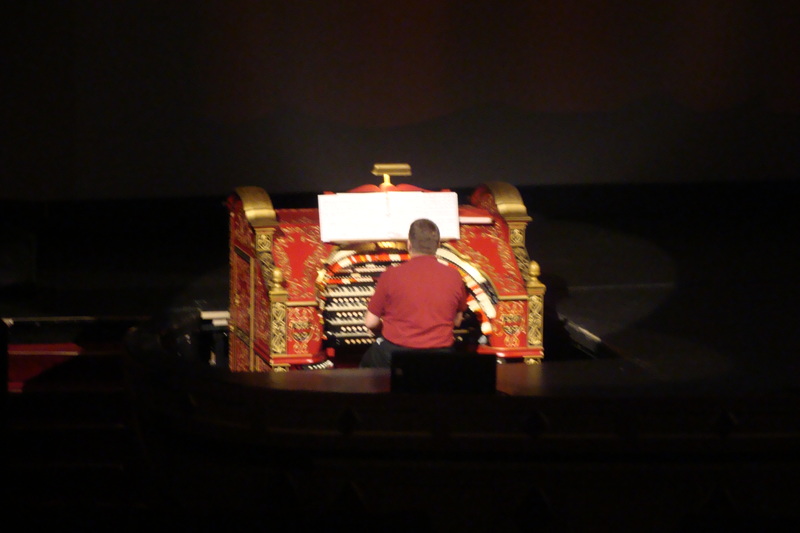 The Wurlitzer accompanied silent movies until the advent of sound–now the organ opens many events and film screenings at the theatre, sometimes with a sing-a-long for the audience. Our screening, having happened so soon after the Fourth of July, was rather patriotic, as you might imagine. Every summer, the Alabama shows classic movies on the big screen on Sunday afternoons (and this year, they’re also showing all eight of the Harry Potter movies, one every Friday night. Makes me wish I lived in Birmingham again!). You can count on at least one screening of 1939’s Gone With the Wind (I mean, DUH–this is the South! ), and the other films range from musicals (1965’s The Sound of Music) to beloved dramas (1942’s Casablanca) to even silent films (1927’s Wings). When Nikki noticed To Kill a Mockingbird on the schedule for this summer, our plans were pretty much set. 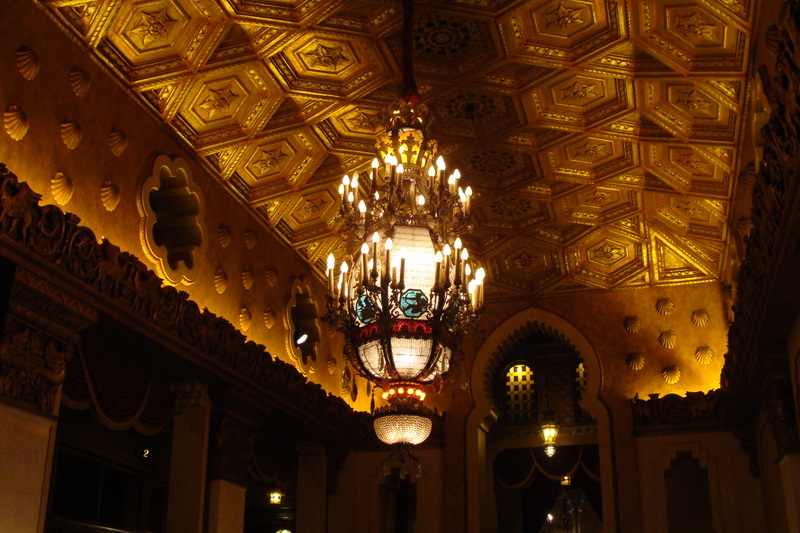 One of the ornate light fixtures and some of the gold leaf work in the lobby. We arrived an hour early and waited outside for about ten minutes with some other die-hard fans before purchasing our tickets and entering the theatre (and good thing, too, because the place was soon packed to the gills–after the show, I overheard an employee estimate that they’d had over seven hundred people there for the showing!). After traveling to all three levels of the theatre (so.many.stairs.y’all. ), we finally found “our” spot, in the box seats on the left side of the screen, where most of us had a great view (though poor Sarah was blocked at times by the annoying, whispering newcomers who slid into the seats in front of us at the last minute). But when the movie began, none of that mattered–I think all of us were in our own little worlds. The film was preceded by various facts about the filming. 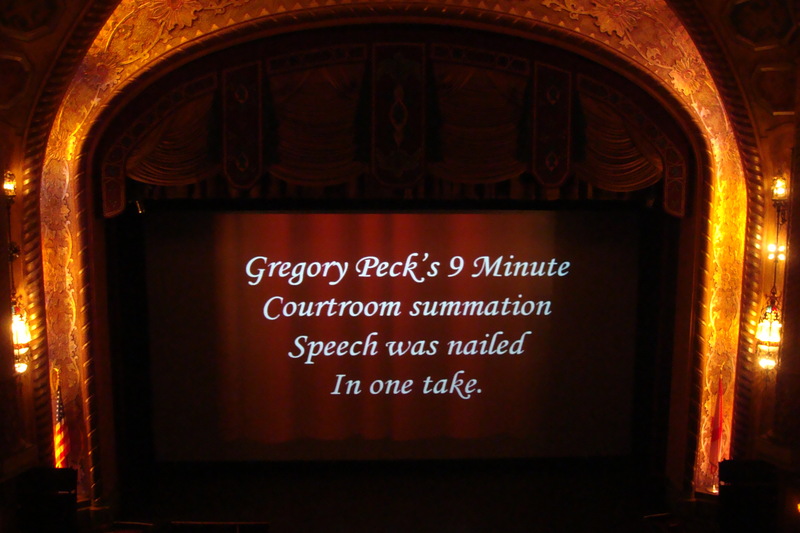 Admittedly, we weren’t watching an extra-special print of the film–in fact, I’m almost positive it was simply a DVD projected onto the screen, because I could have sworn I caught a glimpse of the chapter listing at the beginning of the movie. But it was nonetheless enthralling–as it always is–to lose yourself in the goings-on of tiny Maycomb, Alabama. The audience was generally respectful–no loud talkers, and no cell phones ringing (though from our vantage point, we could see the tiny luminous flicker every time someone pulled theirs out for a gander). There was scattered laughter at the appropriate times, and a gratifying and enthusiastic ovation as the film came to a close. If you are ever near Birmingham and want to have a movie-going experience to remember, I cannot recommend the Alabama Theatre highly enough. Seeing one of my favorite films, with some of my favorite people, at my favorite theatre in the world? This is my definition of heaven. I can’t wait to go back! For more information about the Alabama and to see the schedule of future screenings, check out their website. Great post. I love that you included photos of the theatre.